The top advertisement is from August 13th, 1862. 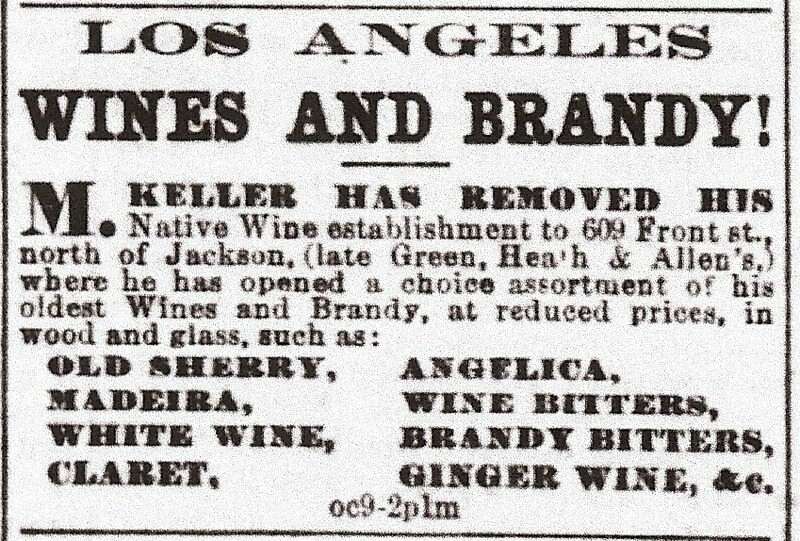 The middle advertisement is from October 9th, 1863. 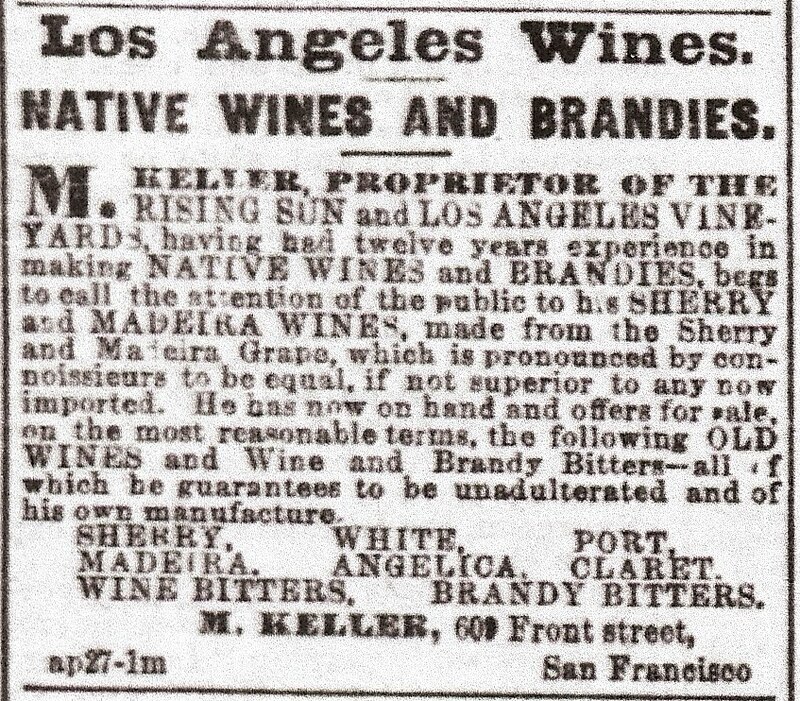 The bottom advertisement is from April 27th, 1864. Does anyone have any information on the California Wine Bitters? Doesn't seem like there is much information on this bottle. What do you SoCal collectors have on this bottle? Any dug down south? 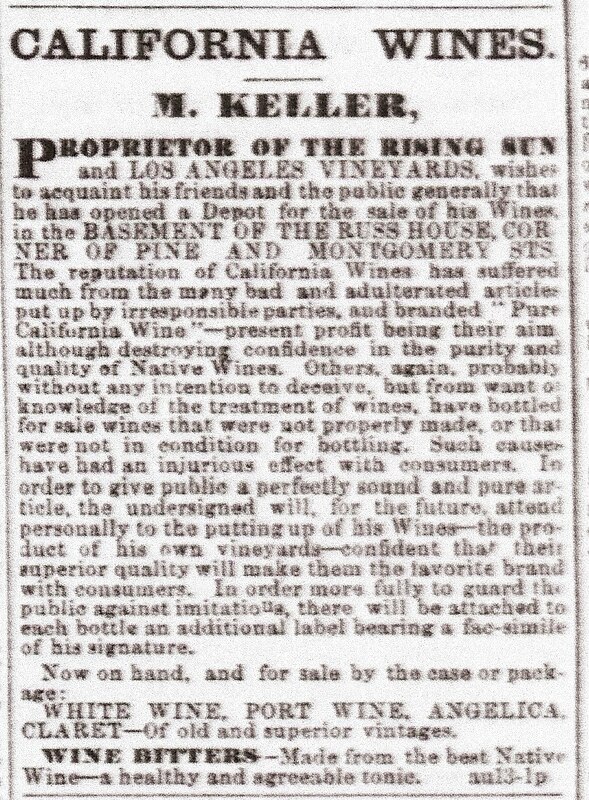 Mathew Keller a viniculturist from Southern California bought a tract of land that had not been improved upon since its original deed in 1847. In 1857 he planted a vineyard and recorded this deed of land. He became one of the early pioneers of wine makers in California, along with Kohler & Frohling and the Sainsevain Bros. as the earliest and largest wine manufacture in California in the early '60's. 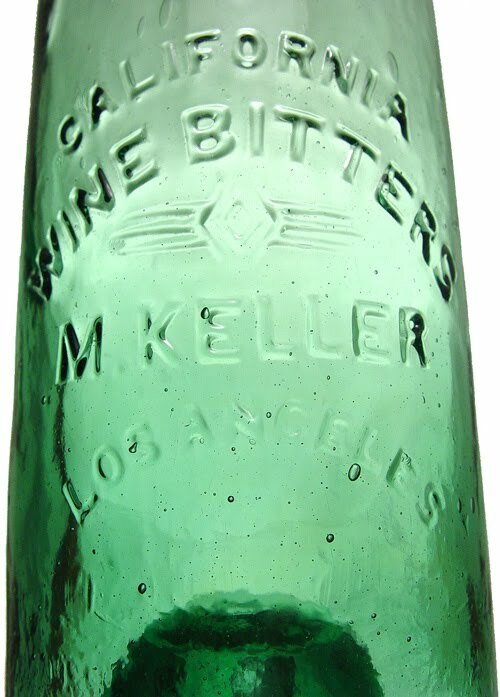 M. Keller went on to produce wines that eventually found favor with the eastern cities in 1871 & '72. He and Isador Landsberger began shipping by ship and by rail thousands of gallons of wines to New England, including his wine bitters. However the facts surrounding the embossed bottle remain quite elusive. In researching this product to try and nail down a manufactured date for this bottle I could find no evidence that would indicate that M. Keller had any type of legal confrontation with Sainsevain Bros. or G. A. Simon or Mercado & Seully or Kohler & Frohling or any one else for that matter that was marketing a similar named product and had prohibited him from marketing his California Wine Bitters using that name on his product. I consider this one of the top 10 Western Bitters. It has a lot of appeal to me for several reasons: The shape is like an IXL but is a little bit older, could Gross and Henley have styled their bottle in an attempt to be like Keller? I have seen every one of the 6 or 7 known examples and have owned 3 of them. Every example I've seen is a different color. 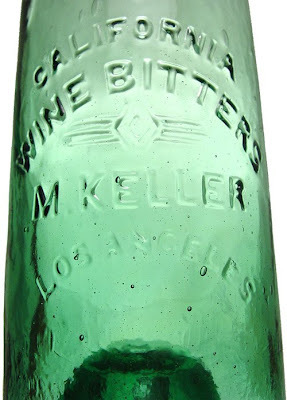 As far as I know, this bottle is the earliest bottle with a Southern Cal town embossed on it. 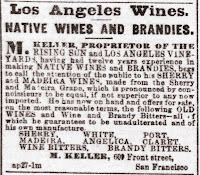 Keller is an early reminder that grape growing and wine at one time was much bigger in Los Angeles County than in places that are popular now like Napa and Sonoma Counties. LA was the wine hub until the late 1880s when the soil went alkali. The 1880 Los Angeles County Historical book has a great litho of Keller's house and vineyard. He was known as Don Mateo down there and rubbed elbows with the rich and famous of the times. The Keller bottles have been found all over, not really concentrated anywhere. I know of a whole example that came from a mining camp in Arizona, one that came from an early river town in the Northern Sacramento Valley, and a broken example from San Francisco. There have even been a few found under bldgs back East in New England... go figure, kind of now makes a little more sense with Rick's mention of the all the wine being shipped to New England. Keller may have had strong contacts there also prior to the Trans-con RR. The glass on most of the examples is very crude and sparkley . The colors have the variances of early Western-blown glass. I'm still not convinced though, that these bottles are as old as books have claimed. I would lean more towards the start of the Western Bitters boom around 1867-68. The absence of a graphite pontil also leads me there, and some of the pits I mentioned where the bottles have been found were of that era.